This year’s Italian GP will not go down as a classic. It got me thinking about 2016 – the season has been very hot-and-cold, with every exciting race cancelled out by a dull and uneventful one. Not too much happened in Monza after the start – Hamilton’s backwards trajectory looked like it would lead to a classic fight-through-the-field, but largely the position was won back through strategy. Nevertheless, there were quite a few things to talk about from the weekend’s proceedings – here’s the Top 5 from Monza! ‘Nando dropped off the pace considerably towards the end of the race in Monza, burning up his soft compound tyres in the crucible of speed. Told by the pit crew that he had “good pace”, the exasperated Spaniard laughed like a cartoon villain and decided to pit with just three laps remaining. Many thought he was coming in to retire, but this was not the case. He opted to pit for some fresh Supersoft tyres for the final three laps, and went out and claimed fastest lap of the race on Lap 51. It gave the team something to cheer about at least, with Monza, as expected a tough race for the team. It was, however the first time a Honda-powered car had set a fastest lap since Ayrton Senna did it (also for McLaren-Honda) back at the 1992 Portuguese Grand Prix. Now that’s what you call a cheeky bet. Cheeky Nando! Haas F1 Team have fared so much better in their debut season than anyone could have imagined. In our pre-season predictions, most of us here at Badger anticipated a struggle to F1 life, with maybe one or two points accrued here or there. Instead, after round 4 of the championship, the American outfit found itself fifth in the Constructors’ championship with 22 points, all of them thanks to Romain Grosjean. Despite all this, the team had not reached Q3 – until this weekend in Monza, where oddly, it was pointless Esteban Gutierrez who took the VF16 to the final phase of quali, not scorer of all their points, Grosjean. An absolutely shocking start for Gutierrez dropped him to 20th position come the end of the first lap, and he could only recover to thirteenth by the end of the race, but as Gene Haas said, it’s still a big milestone, and with RoGro finishing eleventh, they could yet score a few more points before the season is at its end. Clearly, Danny Ric was the only one who had their Weetabix/Berocca/Triple cappuccino before the race on Sunday, because aside from his balls-to-the-wall overtake on Valtteri Bottas, there was very little in the way of action during the race. It was gusty, to say the least, and is reminiscent of Lewis Hamilton’s far-back lunge on Kimi Raikkonen during his maiden Monza race back in 2007, where he finished second. Whatever he took before making this move, we’ll have it too. 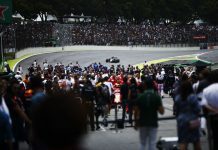 Apologies for the lack of pun in this title, but on a serious note, we learned a few important things about the future of F1 at the Italian GP – firstly, the race will continue to be held at the historic Autodromo Nazionale Monza for at least three more years, with a contract in place to keep the sold-out event on the calendar until 2019. 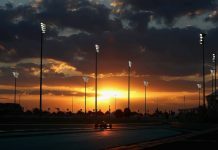 The biggest news, though, is that F1 could be on the verge of being sold to Liberty Media Group, a US-based sports-media-investment group that has shares in QVC and the Atlanta Braves Major League Baseball side. Yes, after years of speculation, two of the friendliest and most popular drivers in the grid announced their future plans. After 15 seasons, including one as a test driver, Felipe Massa will be retiring from F1. With 11 wins in his career, unless Williams pull off a shock win in the last seven races, he will equal fellow Brazilian Rubens Barrichello as the fourth-most successful driver from the nation, behind Ayrton Senna, Nelson Piquet, and Emerson Fittipaldi. His most memorable moment was surely winning the 2008 Drivers’ title for 30 seconds until Timo Glock slid around at Juncao in Interlagos and opened the door to Lewis Hamilton. It’s been a glistening career for Felipe and it seems like the right time for the friendly chap to hang up his helmet and reflect. Button’s situation is a lot more complex, however, with the 2009 Champion opting for a sabbatical. The ultimate RonSpeak phrase of “innovative three-driver line-up” was the spin that McLaren gave it, but the long and short of the deal is that he’s not racing in 2017 unless either Fernando Alonso or new race driver Stoffel Vandoorne aren’t available. He has the option to come back for 2018, which many see as an optional clause in case Fernando Alonso gets itchy feet and doesn’t like the feel of the new 2017 cars. In any case, we’ll miss the pair of them. 2000 was the first season I watched fully, and so while I will miss Jenson as a personality and a driver, I think I’ll miss him even more as a link to the past. Whatever he ends up doing, I think we can all agree that the paddock will be a less handsome cheeky entertaining place without him!